Andrea Gada died after she was hit by a car in Eastbourne, East Sussex. 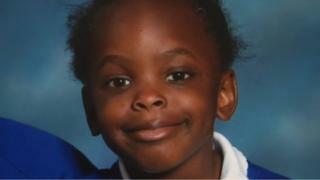 Her funeral was delayed in the hope her grandparents and aunt from Zimbabwe could attend, but temporary visas had been refused twice. The Home Office has now granted the visas, saying the decision had been "made on compassionate grounds". Andrea's father, Wellington Gada, told the BBC: "We are so so relieved, we are so happy with the decision. "The funeral has been postponed and we'll make a new date." Charity Gada, Andrea's mother, said: "We are still trying to organise a lot of things." On Wednesday Prime Minister David Cameron wrote to the family to say he had asked the home secretary to look into their case. It came after a petition, signed by more than 120,000 people, was handed in to Downing Street. Stephen Lloyd, Liberal Democrat MP for Eastbourne and Willingdon, said he had helped the family with their visa submissions. He said: "Nothing can take away the dreadful sense of loss the Gada family have experienced from little Andrea's passing, but at least now they will have the support of her grandparents and aunt at the funeral. "The family have also been bowled over by the tremendous support they have been shown by people in Eastbourne and across the UK. "I would like to put on record my thanks to David Cameron and the Home Office, for finally doing the right thing." James Brokenshire, immigration and security minister, said: "The UK visa system has rules which allow for a decision to be made on compassionate grounds. "Andrea Gada's family have provided new information and assurances in fresh visa applications to enable them to attend her funeral in Eastbourne. "In the light of these details and given the tragic circumstances, these have now been granted."